This summer I've really been into prepared salads. I made them at the beginning of the week and keep them in the fridge so I have something easy for lunch that is a little better than a PBJ. I copied this salad from mt local favorite, Verrill Farm. I had it for lunch one day then immediately bought all of the supplies (there) to make it for myself. Combine cooked pasta, cucumbers, tomatoes, onions, olives, parsley and feta in a large bowl. In a small bowl, whisk together oil, vinegar and seasonings. Pour over pasta and vegetables, toss. 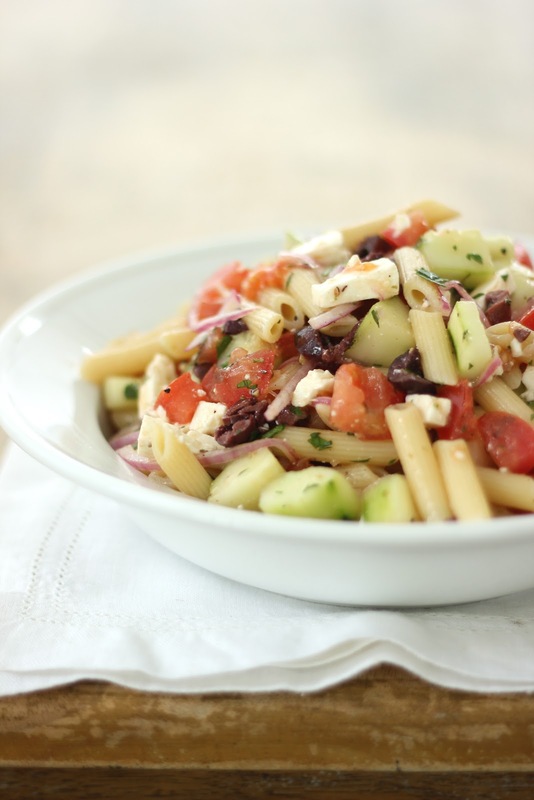 I love using the bold flavors of kalamatas and feta! It's easy to get such an impact of flavor with only a little. Hehe, you have just described my 5 out of 7 days lunch! So refreshing and delicious! I know it sounds crazy but I usually use spaghetti instead of penne for that salad and its works just fine! of being sure they receive all the support and preparation they require to return home. A recovering therapist would be more capable of role modeling how to stay clean and sober.